President Trump dropped a bombshell in Washington on Wednesday when he asked Attorney General Jeff Sessions to resign and appointed his former chief of staff, Matthew Whitaker, to serve as acting attorney general. The move throws into question the fate of Special Counsel Robert Mueller’s investigation into whether the Trump campaign colluded with Russia, which is still ongoing after almost a year and a half. Sessions had recused himself from overseeing the investigation due to his role on the Trump campaign. Whitaker, however, would not have that same issue. 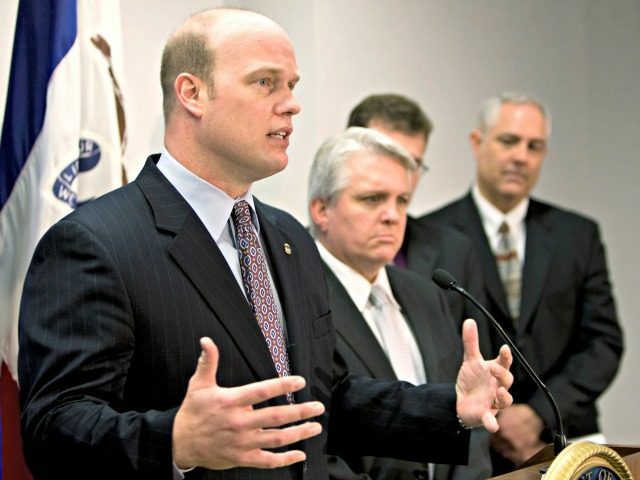 The Justice Department on Wednesday indicated that Whitaker would indeed supervise the Mueller investigation. “The Acting Attorney General is in charge of all matters under the purview of the Department of Justice,” Justice Department spokeswoman Sarah Isgur Flores told Breitbart News in an email. Whitaker wrote that Trump is “absolutely correct” that Mueller investigating the finances of Trump and his family as part of the investigation would cross a line. “The President is absolutely correct. Mueller has come up to a red line in the Russia 2016 election-meddling investigation that he is dangerously close to crossing,” Whitaker wrote in the piece. In fact, Deputy Attorney General Rod Rosenstein’s letter appointing special counsel Robert Mueller does not give Mueller broad, far-reaching powers in this investigation. He is only authorized to investigate matters that involved any potential links to and coordination between two entities — the Trump campaign and the Russian government. People are wrongly pointing to, and taking out of context, the phrase “any matters that arose or may arise directly from the investigation” to characterize special counsel’s authority as broad. “If Mueller is indeed going down this path, Rosenstein should act to ensure the investigation is within its jurisdiction and within the authority of the original directive,” he said. If Whitaker takes over overseeing the investigation, in his view, Mueller would have to ask him for additional authority to investigate Trump’s finances. Rosenstein’s future has also been under question, after the New York Times reported in September that he allegedly suggested he could wear a wire in the Oval Office with Trump, and discussed using the 25th Amendment to have the president removed. Rosenstein denied the report’s accuracy, but has avoided meeting with House Republicans to discuss the matter. He has also irritated House Republicans for fulfilling lawmakers’ requests for documents as they investigate DOJ and FBI bias in their investigation of the Trump campaign. Rosenstein has also drawn heavy criticism from House Republicans for not recusing himself from overseeing the investigation, since he was involved in the FBI’s investigation of the Trump campaign. He had signed off on a Foreign Intelligence Surveillance Act warrant that allowed the FBI to surveil former Trump campaign aide Carter Page. Whitaker’s appointment comes the day after the midterm elections, when Democrats regained control of the House. Democrats had promised to reopen the House Intelligence Committee’s investigation into Trump, to investigate Trump’s finances, and to obtain his tax returns.